The Chugach tree arrived at the Capitol but winds kept it horizontal all day. Photo: Liz Ruskin/APRN. A 74-foot tree cut from the Chugach National Forest near Seward nearly a month ago arrived at the U.S. Capitol today. 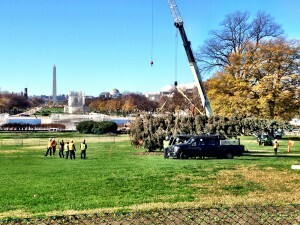 It’s the first time the Capitol Christmas tree has come from the 49th state. 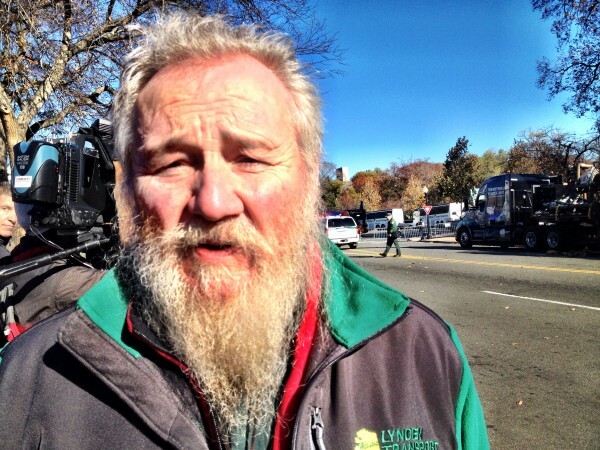 John Schank, the Fairbanks trucker who brought the tree, looks uncannily like Santa Claus. Photo: Liz Ruskin/APRN. The Lynden Transportation driver normally plies the Dalton Highway. He was chosen for this mission in part because of his long, accident-free career. But Schank just happens to have a long white beard and – no kidding — red-apple cheeks and twinkly eyes. He patiently stood for back-to-back media interviews as the tree was detached from the truck and hoisted by crane. Bruce Ward was part of the tree’s cross-country entourage, which had its own band: Blackwater Railroad Company, of Seward. Ward says the good-natured Alaska trucker was a big hit at the 15 events they held along the tree’s route. 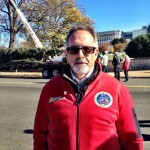 Ward leads a nonprofit called Choose Outdoors that coordinates with the Forest Service to bring a tree to the Capitol from a different national forest each year. The organization raised $650,000 in corporate donations to transport the Alaska tree. Shell, he says, gave the most: $50,000, plus fuel. Ward says the Lutz is a great specimen, nice and full. Ward says there were countless special moments on the tree’s journey, starting when they were in the Chugach to fell it. This was after a big search, after the superintendent of the U.S. Capitol Grounds had already flown to Alaska to select it from among the finalists. Ward says on the big day they asked Kenaitze elder John Ross to bless the harvest. A crane moved the tree from the truck to the Capitol lawn this morning, but it remained horizontal today due to high winds. Crews hope to set it upright this weekend, weather permitting. The tree will be lit at a ceremony on Dec. 2 by Soldotna fifth-grader Anna DeVolld, with help from the Speaker of the House. 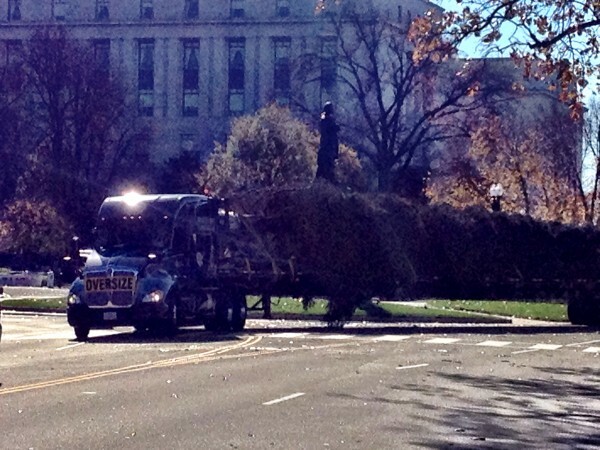 The tree makes its final turn at the Capitol. Photo: Liz Ruskin/APRN.